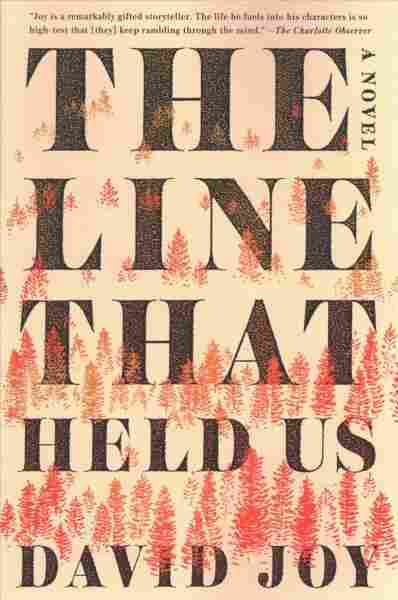 'The Line That Held Us': Noir In Appalachia Novelist David Joy, whose books chronicle the rural, working-class South of his own milieu, has penned a new book where a hunting accident triggers a thriller of violent vengeance. That shooting leads to a cover-up that spins out of control. Along the way, we meet a fascinating and ferocious character: Dwayne Brewer is a giant of a man who will not rest until his brother Carol's death is avenged. The book is set in Appalachia, where Joy lives. In fact, we spoke to him last year about his essay "Digging in the Trash," where he lamented the misportrayal of rural Southerners. Like his nonfiction essay, his new work of fiction is personal to him. "I think a lot of times, rural working-class people are stripped of their humanity, and I'm very much trying to give that humanity back," Joy says. "On the other side of that is that I'm trying to document some of the things that I think are disappearing. I think that we're within a generation of a lot of the old mountain ways being gone." One thing that's kind of indicative of this area is that family is an incredibly important thing. People are still very much rooted to family and rooted to place. And so this is not just your everyday friendship, this is very much — it might as well be his sibling, it might as well be blood. And so when [Darl] calls on Calvin Hooper, Calvin would have done anything in the world for Darl. And so very early on, we've got this relationship building where the question is: How much do you love someone, you know? How much are you willing to risk in order to protect the ones you love? You know, as far as the character who grows the most over the course of the book, it's very much Calvin. And that growth comes about because Dwayne forces him to make that decision. He forces him to realize who he loves selflessly. Dwayne Brewer and his brother Carol grew up kind of in an abusive home, and he also — he grew up at the very, very bottom-most levels of poverty to the point that kids at school made fun of him because of the shoes he wore, or they made fun of him because [of] where his mother worked. Dwayne has always protected his brother because Dwayne, he's a lot more physical, a lot more violent than Carol ever was, you know. Carol was very much a turn-the-other-cheek kind of guy, and Dwayne was much more a grab-you-by-the-throat. But I think what makes Dwayne so interesting is that he's the antagonist, but he has a very strict moral code that he's following. One of the scariest things that can happen with a bad guy when you find yourself completely agreeing with him — you know, when they make total sense. And I think there are multiple places in this novel where you find yourself nodding your head to the things that Dwayne thinks, and the things that Dwayne does. Yea, I've talked about that as well in the sense that I cannot imagine any American writer creating anything right now where you don't have violence, where you don't have misogyny, where you don't have racism, where you don't have xenophobia, where you don't have a perversion of faith. I think it's impossible for anyone to look at what's going on around us right now and ignore those things, you know. And writers and artists are very much sponges, you know — we soak up everything. And so I do think that's one of the reasons that that's so prevalent in my work. And then at the same time, you know, I think it's also always kind of been — those have been major themes in Appalachian literature and in Southern literature — and Appalachian culture. I mean, when I think about the old murder ballads that they played in bluegrass, it was that same type of thing, those same types of stories. That history — I'm not sure why that history exists. But as far as how it relates to what's happening nationally right now, I think maybe it's more pertinent right this second than it's ever been. Peter Breslow and Evie Stone produced and edited this interview for broadcast. Patrick Jarenwattananon adapted it for the Web.